Kijken alsof je alles voor het eerst ziet. Het laten zijn van wat er om je heen gebeurt en is. Kijken als een kind verlost de wereld van goed en kwaad, het verlost ons van de etiketten die wij geplakt hebben op alles wat we zien. Het enige probleem is dat we geen kind meer zijn en ook nooit meer zullen zijn. Hoe nu verder? Hoe te zien zonder te plakken? Laszlo Moholy Nagy liet mij dit ervaren, of tenminste gaf mij de kans dicht bij deze ervaring te komen. Zijn film Berliner Stilleben laat het dagelijks leven in Berlijn zien in de jaren dertig. Het was bijzonder om te zien hoe een camera, het vastleggen van je eigen dagelijkse omgeving je dwingt met andere ogen te kijken. Alles is, niets meer niets minder. Dit werk, dat geruisloos mij een wereld aanbood, zette me aan het denken over mijn eigen wereld. Waarom heb ik het gevoel dat toen, in 1931, de dingen meer ruimte kregen? En waarom denk ik dat als ik weet dat dit niet zo is? En ja, er is maar een conclusie; de wereld die ik daar in dat kleine kamertje in het grote meesterwerk van Berlage aan me voorbij zag trekken, is exact de wereld die ik nu, al schrijvende, om mij heen zie. Het zijn enkel de kinderogen die ontbreken. 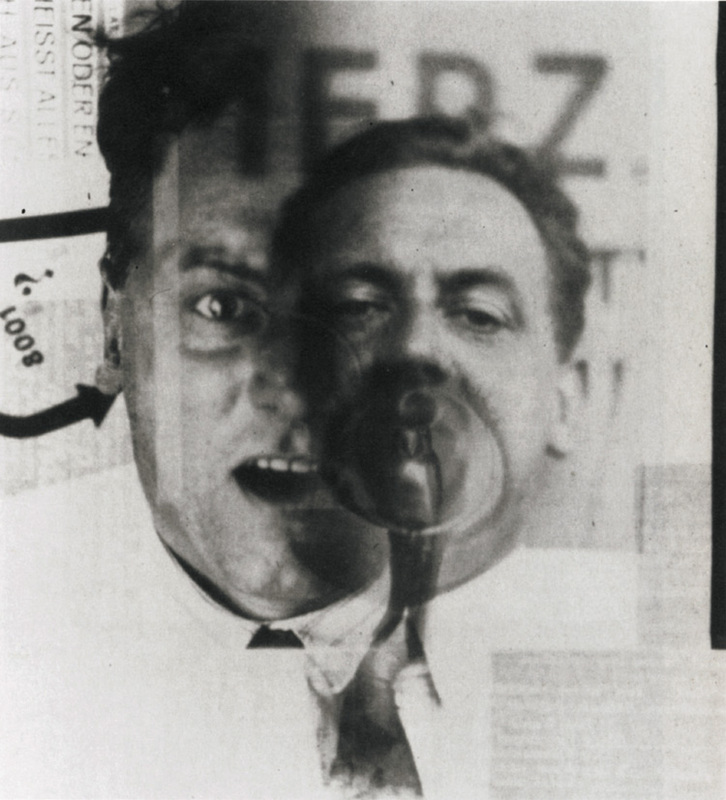 Moholy Nagy heeft op geniale wijze afstand genomen van zijn natuurlijke omgeving en uiteindelijk, misschien juist door middel van de afstand,een nabijheid gecreeerd die de verklaring ondergeschikt maakt aan de ervaring. Los van dat hij dit op een zeer gevoelige en in mijn ogen briljante manier heeft gedaan, gaat het mij vooral om zijn alerte gewaarzijn. Je open stellen voor de gewone dingen en het nu de kans te geven in alle eerlijkheid zich aan je te openbaren is een kracht die, niet alleen als kunstenaar, maar ook zeker als mens je meer zal brengen dan wat ook. Moholy Nagy heeft mij op die donderdagmiddag bewust gemaakt van de dunne scheidslijn tussen afstand en nabijheid. En door middel van het tonen van zijn wereld heeft hij mij meer laten zien van de mijne dan dat ik tot nu toe zag. Voor even was ik een kind, zo open, gevoelig en nieuwsgierig. Ik heb gekeken en gezien. Experimental Documentary That Brings Truth Of Daily Life. When I walked around In the van Abbemuseum in Eindhoven I was very enthusiastic when I found a beamer projection on the wall which was playing an old movie. 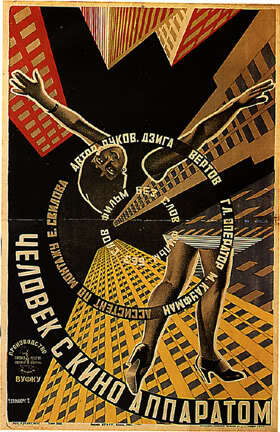 The name of the movie: Man with a movie camera, was new for me, as well was the artist: Dziga Vertov. As I stood there watching a city was shown to me. this has to be Russia I thought. But I could only guess it. As well as I could only guess to the meaning of the images: the busy street shots at one hand and at the other hand the shots of filming camera’s. This is the reason I picked this work, because it tickled my curiosity. The movie dates from 1929. How wonderful and fascinating to look true time and space, I thought. At home I looked up information and watched the movie completely. 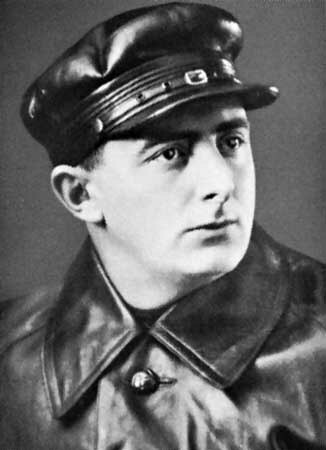 So it appeared to be that Dziga Vertov was born in Bialystok (now a days Poland) in 1896 under the name Denis Arkadevich Kaufman. 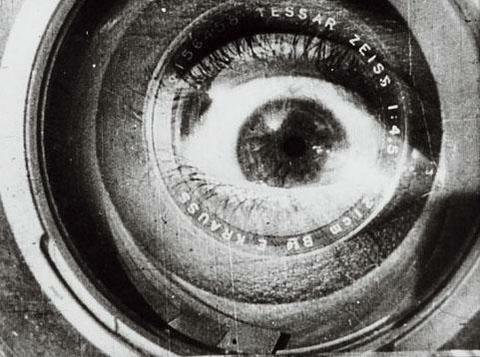 Vertov was an idealist. He wanted to show his audience the truth but at the same time let them realize that the truth in a film is manipulated. He does this by showing only shots of what is truly happening; so no theater, script or film set and involving in his movie shots of filming camera’s. With a very experimental movie as consequence. I find the idea interesting, although it is for me completely different. I don’t mind watching complete fiction, I am more interested in how the images look. 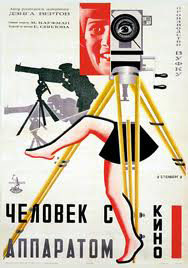 The images in Man with a movie Camera are really impressive. The shots (frozen and moving) are photographical. The editing is in the film is musical. This is maybe the reason why I fell in love with it. Since my eyes are always searching for photographic images (photo or video) as well as I am interested in the editing of movies. Being forced to see geometry everywhere and anyhow was an interesting experience at Van Abbe museum. I feel a certain panic when I enter a museum. The urge to discover something to relate with grows bigger and bigger so then I’m obliged to think about the works surrounding me. In my search for something familiar, I saw a black cube in one of the first rooms of this museum. I had then the curiosity to pas through a claustrophobic space to get in it. The first seconds I was feeling only disgusted by the crowded environment around me. Proun was presented in this black cube, a black cube, that I associate with a black square so, of course, with political suppression. I was faced with a completely contrasting but yet, perfectly compact universe. As his paintings give the viewer the space feeling, there’s no wonder he is strongly relating with the 3d world as well. 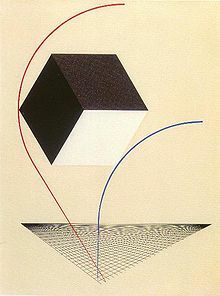 Exploring Lissitzkys well defined visual language made me think more about politics in a way or another, that may be because I feel a certain irony in some of his works. In a time when society was build on a strictly determined target of organizing and developing masses by being as productive as possible, he was trying to spread positive and gratefulness messages in a world were starving was the main problem. That’s quite ironic. Still, it seemed to me that Lissitsky was more preoccupied with his intention of exploring and playing with geometrical forms and symbols, rather then with this political propaganda. Lissitzkys interest in so many fields of art, like design, photography, typography and architecture it’s something to admire. That may be caused by the lack of means in expressing one idea, or maybe by his wish of being as free as possible. His universe condensed in that black cube make me think about his freedom as an artist. His freedom and his natural speed of development that was trying to run away from art propaganda and was expressed in the most simple and abstract way. 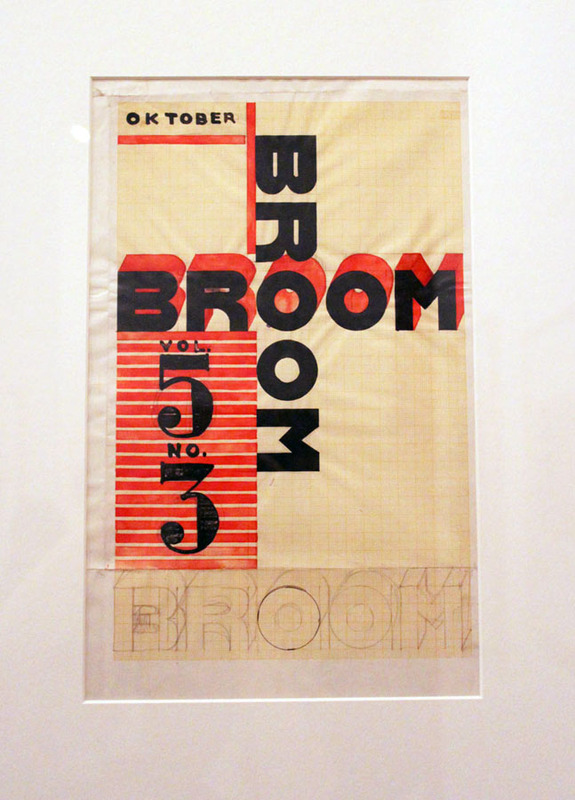 In most 2 dimensional work of Lissitzky you can see clearly that he left the old world symbols and created new ones with his ability of typography and photomontage. His art is with power and purpose intending to invoke change. The work being very dynamic reflects the dynamism of a change. His very architectural forms also indicate his passion to organize, to build something new with spacial elements like volume, mass, color, space and rhythm. 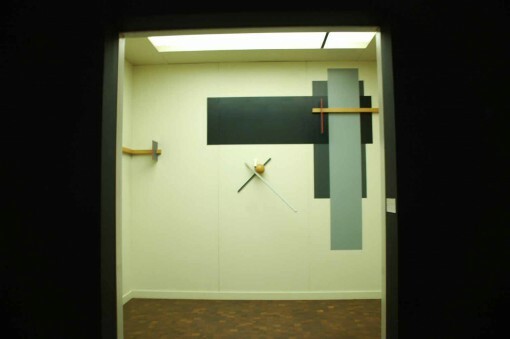 For me the best representation of the dynamism of his work was reflected in the elevator of the exhibition space. It was as if I was being moved up and down by just the volume and rhythm change in a simple sound created by a crowd of people. 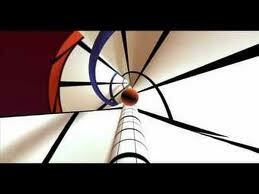 Movement being created and represented by Lissitzky in words and colors and shapes was already quite interesting but it being in the form of a simple sound was something else for me. Sound can be liberating as much as it can be capturing, one could also look at it as being limited in an elevator, the same as being limited in a communist country, or under a nazi regime, or being limited by the lack of technology and opportunities. The idea at the end of the exhibition was for me equal to that at the beginning, the part where we watched the opera “Victory Over the Sun” by Malevich in the library. 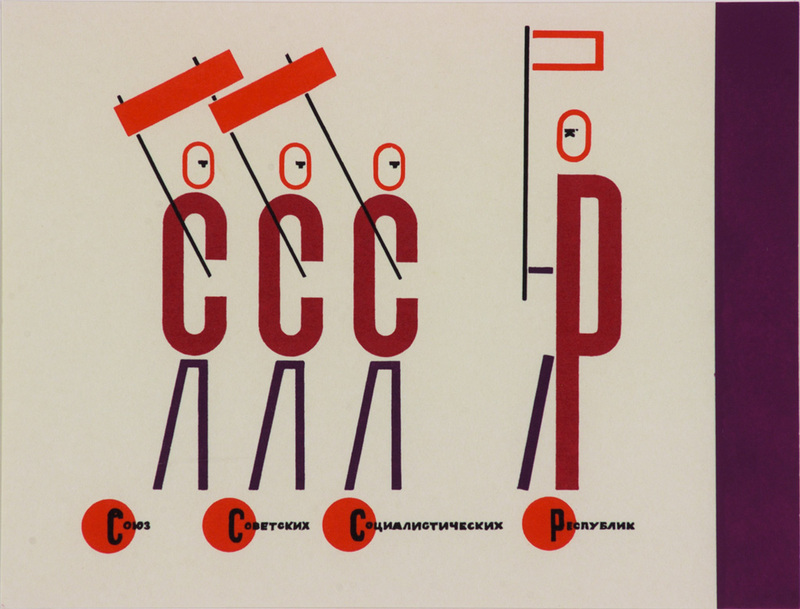 I was intrigued by the idea of choreography being shaped by the LIMITATIONS of movement caused by geometrical costumes taken from lissitzky’s 2D drawings. I found out after this exhibition that what draws me in is the limitations. They inspire me. Every limitation requires a different dance which is waiting to be danced. How long I’ve been waiting for you, and finally, of course I m gonna spend all day in a museum. I was quite disappointed; naaa half disappointed, cause of the Sun, I can t be in a bad mode. Toilet.Library.Toilet.” Victory over the Sun“movie. Toilet. Wardrobe. The opera has made me forget my pain. I started to love that place instead. Prokofiev, definitely, he was in my mind with his Dance of the king when I was in the first room. Concepts expressed by words, reduced to lines, shapes, sharp, direct fired into space. I really like it. Clear and direct. Art as propaganda, for the mass……Like design? S#@°!t it must be really hard, if you are a designer, in a way you must be kinda psychologist, a bridge. Tchaikovsky, Stravinsky, Rubinstejn…….Vivaldi !! the Spring from the 4th season, second floor, big sunny window. After, that I was no longer interested in individual pieces of art. I quickly started to wander in space. empty.full.shadow.light. The rooms themselves were art boxes containing art. I couldn’t stop smiling. Wagner: Ride of the Valkyries. I went out. Essential for life on Earth. It was quite hard for me to make a decision about one work of the Russian suprematist artist El Lissitzky, since this extreme emptiness and simplicity in images mostly gives me an uncomfortable feeling of being lost. 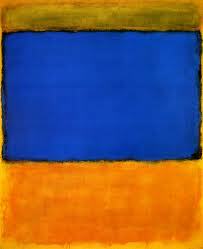 On the other hand, it can also give me a feeling of structure, of organization and a somewhat mysterious clarity. So my feeling towards these means of visual language is kind of ambiguous. What is very interesting about the confrontation with abstract art, is that you either comprehend the piece (because you’ve read or heard about it or simply because you are part of the very same movement), or you don’t. If you don’t, you have to fill the empty brainspace with your own thoughts and ideas about the suggestion that is made or what is being implicated, which is most of the time impossible to guess without any information since it’s so abstract. How does a person that doesn’t know that Malevich’s Black Square is representing the party perceive the painting? And is it wrong if that person imagines that there is another meaning, just for him? I really don’t know. 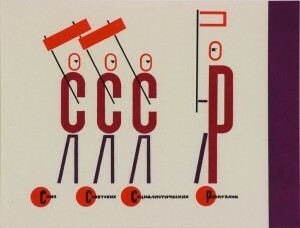 I partly like how graphic elements are presented by Lissitzky and how they carry a connotation that has to be detected. They become emblems for and references to something so much more than themselves. So they turn into something completely different and in a way unworldly, but in a very modest, unpretentious way, sometimes even a tad clichéd. One of his propaganda posters in the exposition, “Beat the Whites with the Red Wedge” from 1919, is especially nice as an example. 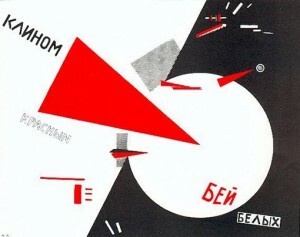 The red wedge is a symbol for the active bolshevists who are overcoming their rival, the white movement, interestingly enough represented by a white opening in a black background, which is pierced by the red triangle. I like the simple clarity of his choice, but am not a fan of the additional shapes and letters since they are too mysterious for me and disturb the beauty of the image in my eyes. Then again, it’s propaganda. Welcome all of you born and not yet dead! De mens speelt zijn hele leven, elke dag, misschien wel elke minuut, een andere rol. Tegenover elk persoon verhoud je je anders. We leven met masker, kostuum en aangeleerde manieren. Zonder valt niet of nauwelijks te leven. De ene dag ben je slecht, vijandig, dan weer lief en onschuldig of je voelt je als een zak aardappels. Als ik me voel als een aardappelzak, zorg ik er voor dat de aardappelzak omhult is door een zwierige jurk en felle lippenstick. Uiterlijk is misleidend. De meeste zullen pas denken dat je een aardappelzak bent als je een jute doek omslaat en muf ruikt. Mensen reageren op wat ze kennen. Heb je een goude oorbel in dan ben je crimineel, homo of gabber. Cliche's zijn makkelijk. Bij een slecht iemand denk ik meteen aan een kauwgom kauwende man met een leren jas en een snor. Dit plaatje zit vastgeroest in mijn hoofd. Toen ik het operastuk: De overwinning over de zon, met decors van Kasimir Malevich zag, was ik gegrepen door de vervreemdende taal en beeldtaal. Abstract. Weinig aanknopingspunten, waarin je vastgeroeste denkbeelden zou kunnen terugvinden. Ander taalgebruik, andere tonatie van de stem, abstracte kostuums. Het karakter, de slechte man, kreeg in dit stuk een hoekig pak aan. Zonder dat het aansloot op zijn lichaam. De vorm van het pak werd eerst gemaakt. Daarna kon de slechte man zich hiertoe verhouden en aanpassen. Zijn bewegingsvrijheid hing af van het pak. In het kostuum zijn geen cliché’s gebruikt. Ook niet in het pak van de vijand, de nieuwe mens , de dikke man enz. Dit vind ik een welkome verrassing en zelfs een opluchting. Doordat bewegingen, taalgebruik en kleding onherkenbaar blijven, dwingt het je anders te kijken, te denken en te luisteren. Niet te snel te oordelen. Het stuk is een zoektocht naar herkenningspunten in een wereld die je vreemd is. In dit stuk maak je je eigen waarheid zonder het zien van cliche's of rookwolken. In the “beginning” all was dark… Paintings were hanging in dark rooms and the walls were so filled that one could barely see the landscape paintings for all the landscape paintings in the salon. Anyhow, most people were happy that they could consume the art, just like people since the ancient Vatican sculpture gardens. In 1812 the first “art-only” building was created by the English architect Sir John Soane. Finally! Here the art could be viewed for what it really was, perhaps even art selected with great taste, as Kant would have wanted it. In the late 19 century the number of galleries and art museums were booming. Every “metropolis” had to have its own museum of art to be a metropolis. When we are approaching the mid 20 century old ways of building institutions of art, often retro romantic, were abandon for more “clean” and architectural deconstructed rooms, an early examples is the Guggenheim in New York. Exiting times. At the Van Abbe-museum in Eindhoven you can walk around in beautiful, calm, strictly white and spiritual rooms filled with modernistic art. The worlds’ largest collection of Lissitsky paintings are finding its’ place like a perfect sized glove. Modern art for a modern room! On the second floor an exhibition about art is presented. Or rather an exhibition of art. Or an exhibition of artworks about the modern art museum, but with new art. Or an exhibition on ehee. When visiting this exhibition a feeling of unrest is present, an urge to maintain the “white cube” intact. 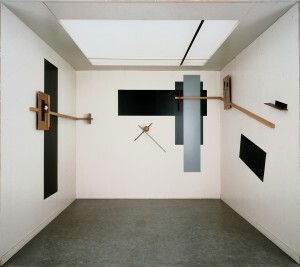 The room can only be intact when art is made in respect of the cube. 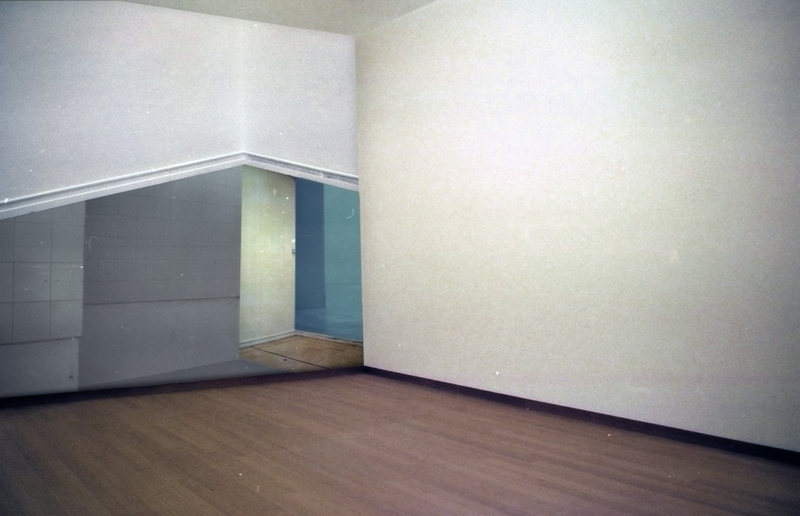 But what happens when people get tired of the white cube, when artist don´t agree that their works need the white cubes, when the curators finds them self unable to fill their holy rooms? Maybe the beautiful buildings of high modernism will slowly decay? Well to calm the museum directors I have taken my responsibility and re-used the modern room to create new room! Deconstructed the deconstructed. A post modern solution to keep modern. Now we all can sleep well. 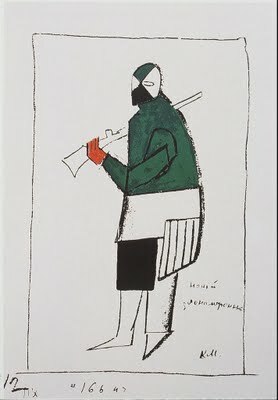 De gehele expositie ‘monumenten voor de toekomst, El Lissitzky’ trof mij als warrig, misschien mede door het eerst kijken van het theaterstuk, waar hij aan had meegewerkt, uitgevoerd door Amerikaanse theatermakers, lang na zijn dood.